242 pages | 10 B/W Illus. Most Wesleyan-Holiness churches started in the US, developing out of the Methodist roots of the nineteenth-century Holiness Movement. The American origins of the Holiness movement have been charted in some depth, but there is currently little detail on how it developed outside of the US. This book seeks to redress this imbalance by giving a history of North American Wesleyan-Holiness churches in Australia, from their establishment in the years following the Second World War, as well as of The Salvation Army, which has nineteenth-century British origins. It traces the way some of these churches moved from marginalised sects to established denominations, while others remained small and isolated. Looking at The Church of God (Anderson), The Church of God (Cleveland), The Church of the Nazarene, The Salvation Army, and The Wesleyan Methodist Church in Australia, the book argues two main points. Firstly, it shows that rather than being American imperialism at work, these religious expressions were a creative partnership between like-minded evangelical Christians from two modern nations sharing a general cultural similarity and set of religious convictions. Secondly, it demonstrates that it was those churches that showed the most willingness to be theologically flexible, even dialling down some of their Wesleyan distinctiveness, that had the most success. 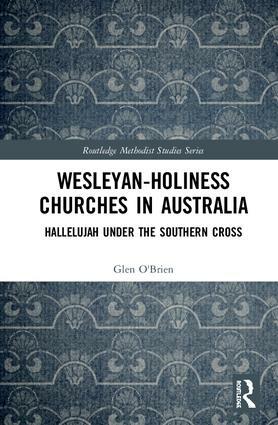 This is the first book to chart the fascinating development of Holiness churches in Australia. As such, it will be of keen interest to scholars of Wesleyans and Methodists, as well as religious history and the sociology of religion more generally. Glen O’Brien is Research Coordinator at Eva Burrows College, within the University of Divinity and a Member of the University of Divinity’s Centre for Research in Religion and Social Policy. He is a Research Fellow of the Australasian Centre for Wesleyan Research and an Honorary Fellow of the Manchester Wesley Research Centre, UK. He has published widely on Wesleyan and Methodist themes and engaged in post-doctoral research at Duke University, Asbury Theological Seminary, Oxford Brookes University, and Nazarene Theological College, Manchester. He co-edited, with Hilary M. Carey, and contributed several chapters, to Methodism in Australia: A History (2015).